A containers provider is a service that manages container resources, and can be added to the Red Hat CloudForms appliance. The Compute → Containers area has options to add and manage containers providers. This includes the Providers page, which displays all discovered or added containers providers. Red Hat CloudForms supports adding OpenShift Enterprise as a containers provider. When deploying OpenShift Enterprise using openshift-ansible-3.0.20 (or later versions), the service account and roles required by Red Hat CloudForms are installed by default. To obtain the token to use for the provider definition, follow the instructions below for your OpenShift Enterprise version. This command provides the token needed to add an OpenShift Enterprise provider. Replace management-admin-token-0f3fh with the name of your token. To collect the node, pod, and container metrics, you must run the OpenShift Metrics services inside your cluster. For more information, see Enabling Cluster Metrics in OpenShift Enterprise Installation and Configuration. For metrics collection to work properly, you also need to configure Red Hat CloudForms to allow for all three Capacity & Utilization server roles, which are available under Configure → Configuration → Server → Server Control. For more information on capacity and utilization collection, see Assigning the Capacity and Utilization Server Roles in the Deployment Planning Guide. After initial installation and creation of a Red Hat CloudForms environment, add an OpenShift Enterprise provider using the token obtained in Section 5.1, “Obtaining an OpenShift Enterprise Management Token” and following the procedure below. Click (Configuration), then click (Add a New Containers Provider). From the Type list, select OpenShift Enterprise. Enter the appropriate Zone for the provider. By default, the zone is set to default. Enter the Hostname or IP address of the provider. Enter the Port of the provider. The default port is 8443. Under Credentials, enter the token in the Token field. This is the token obtained earlier in Section 5.1, “Obtaining an OpenShift Enterprise Management Token”. Click Validate to confirm that the Red Hat CloudForms can connect to the OpenShift Enterprise provider using the provided token. To see more detail on an item in the timeline, click on it. A balloon appears with a link to the resource. For Amazon EC2 (AWS) and Google Cloud Engine (GCE) support, OpenShift must be installed using the relevant cloud provider. For more information, see the OpenShift Enterprise Installation and Configuration guide. 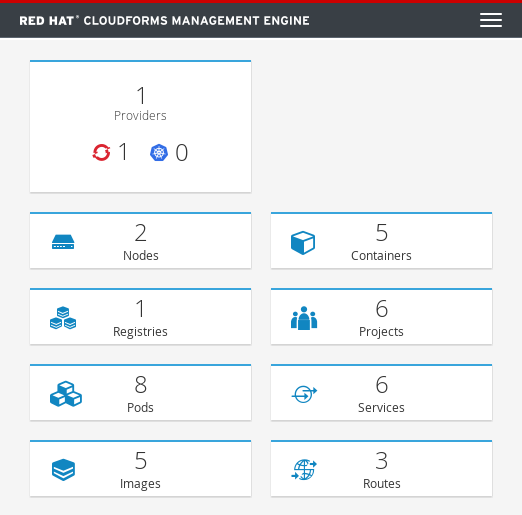 The information on all containers providers and entities known to Red Hat CloudForms is summarized on the Containers Overview page. The Overview page provides links to other summary pages which contain further information on the containers providers and entities. Navigate to Compute → Containers → Overview. Click the desired containers entity, or provider, if applicable, for viewing the summary with further information. Status of the provider and its components. Relationships between different entities of the containers provider. These relationships are summarized in the Relationships box on the right-hand side of the summary page. Additional information on aggregated capacity of all CPU cores of all nodes, and aggregated capacity of all memory of all nodes. Click the desired containers provider for viewing the provider summary. How many entities are on a node? What is the capacity and utilization? What are the versions of the underlying operating system and software? In the Relationships box on the right-hand side of the summary page, click Nodes. Click the desired container node for viewing. Alternatively, you can access the desired container node from Compute → Containers → Container Nodes. You can view the timeline of events for a node. To access the timeline from a container nodes summary page, click (Monitoring), and then (Timelines). What are the relationships of the container to a related node, pod, or image? Which node is the container running on? Which part of a pod is the container? What is the container ID? What is the name of the container image? What are other properties of the container image (for example, tag)? In the Relationships box on the right-hand side of the summary page, click Containers. Click the desired container for viewing. Alternatively, you can access the desired container from Compute → Containers → Containers. Which containers are using the image? Which image registry is the image coming from? In the Relationships box on the right-hand side of the summary page, click Images. Click the desired image for viewing. Alternatively, you can access the desired image from Compute → Containers → Container Images. How many images are coming from the registry? What are the images? Which containers are using images from the registry? What is the host and port of the registry? In the Relationships box on the right-hand side of the summary page, click Image Registries. Click the desired image registry for viewing. Alternatively, you can access the desired image registry from Compute → Containers → Image Registries. Which containers are part of the pod? Which services reference the pod? Which node does the pod run on? Is the pod controlled by a replicator? What is the IP address of the pod? In the Relationships box on the right-hand side of the summary page, click Pods. Click the desired pod for viewing. Alternatively, you can access the desired pod from Compute → Containers → Pods. What is the number of requested pods? What is the number of current pods? What are the labels and selector for the replicator? In the Relationships box on the right-hand side of the summary page, click Replicators. Click the desired replicator for viewing. Alternatively, you can access the desired replicator from Compute → Containers → Replicators. What are the pods that the container service provides traffic to? What are the port configurations for the container service? What are the labels and selector for the container service? In the Relationships box on the right-hand side of the summary page, click Services. Click the desired service for viewing. Alternatively, you can access the desired service from Compute → Containers → Container Services. Which pods is the volume connected to? What are the volume’s connection parameters? What is the volume’s storage capacity? What are the volume’s iSCSI target details (if applicable)? Navigate to Compute → Containers → Volumes. In the Relationships box on the right-hand side of the summary page, click Volumes. Alternatively, you can access the desired volume from Containers → Volumes. What build configuration is the container build based on? What build instances have been created? Which phase in the build process has the instance completed? Which pod does a build instance reside in? Navigate to Compute → Containers → Container Builds. In the Relationships box on the right-hand side of the summary page, click Container Builds. Alternatively, you can access the desired container build from Containers → Container Builds. 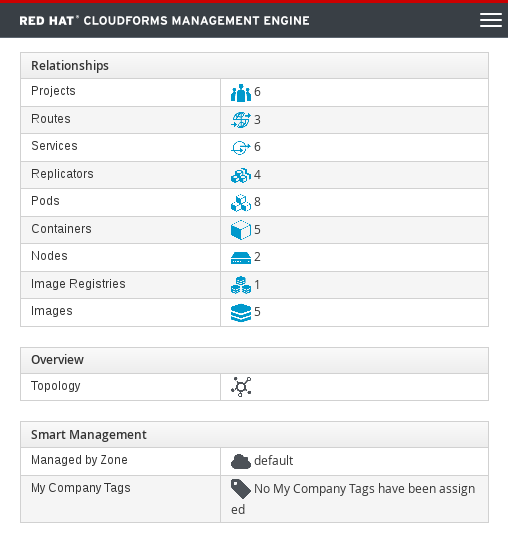 The Topology widget is an interactive topology graph, showing the status and relationships between the different entities of the containers providers that Red Hat CloudForms has access to. The topology graph includes pods, containers, services, nodes, virtual machines, hosts, routes, and replicators within the overall containers provider environment. Each entity in the graph displays a color indication of its status. Double-click the entities in the graph to navigate to their summary pages. It is possible to drag elements to reposition the graph. Click the legend at the top of the graph to show or hide entities. Click Display Names on the right-hand side of the page to show or hide entity names. On the provider summary page, click Topology in the Overview box on the right-hand side of the page. Perform a SmartState Analysis of a container image to inspect the packages included in an image. Navigate to Compute → Containers → Container Images. Check the container image to analyze. You can check multiple images. The container image is scanned. The process will copy over any required files for the image. After reloading the image page, all new or updated packages are listed. To monitor the status of container image SmartState Analysis tasks, navigate to Settings → Tasks. The status of each task is displayed including time started, time ended, what part of the task is currently running, and any errors encountered.